The fourth annual gathering was all about presenting positive models for improving our parks. Guild Park. Photo by pheersink from the Torontoist Flickr Pool. Nobody likes a whiner. Complaining is part of activism, but advocates for causes like public parks must ensure that their words are supported by concrete actions and a positive, constructive approach to problems before bureaucrats will take them seriously. This was one of the points discussed during Saturday’s Toronto Park Summit organized by Park People. Substance was the key to the presentations shown to the 400 attendees at the Daniels Spectrum in Regent Park for the fourth edition of the summit. Instead of presenting imaginative sketches of pie-in-the-sky proposals, both Benepe and representatives of four local parks advocacy groups discussed achievable aesthetic and operational improvements for urban parkland. For dense city cores like Toronto’s, Benepe promoted recycling existing abandoned infrastructure such as brownfields, old factories, and rail lines into parks. While Benepe discussed New York projects such as reclaiming the Brooklyn waterfront, it’s easy to see Toronto spaces like Evergreen Brick Works, Corktown Common, and Waterfront Toronto’s system of parks filling this model. “These marginal spaces are the parks of the future,” Benepe noted. He also stressed the need for a range of partnerships spanning the public/private spectrum. In cities like New York, this has meant establishing non-profit conservancy groups to manage some parks. Benepe believes that employing outreach coordinators, which was done as part of a project between the New York City parks department and a local advocacy group, was vital to nurturing parks advocacy groups and their volunteers. When an audience member raised the spectre of a two-tiered park system where some spaces would be better funded and maintained than others, Benepe discussed “sweat equity”—parks advocacy groups not rolling in money could rely on volunteers to aid with planting and general maintenance. He feels that those who invest their time in a particular park shouldn’t be charged event fees. 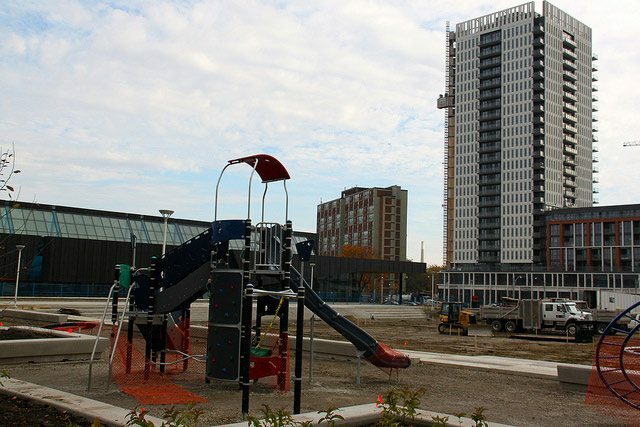 Across from where the Toronto Park Summit was held in Regent Park, a new park rises. Photo by Linda Edwards from the Torontoist Flickr Pool. The importance of partnerships and volunteers was evident during short presentations on four local advocacy groups. Friends of the York Beltline, a group dedicated to promoting a linear park along the Beltline trail west of Allen Road, has developed its membership through a Facebook group and its local city councillor’s mailing list. Friends of Earl Bales Park evolved from local Filipino and church groups into an organization that has coordinated a local arts festival. In Etobicoke, a community health centre and the Panorama Community Garden teamed up to promote the first Rexdale Foodie Fest last year, bringing the neighbourhood together for free, healthy food. 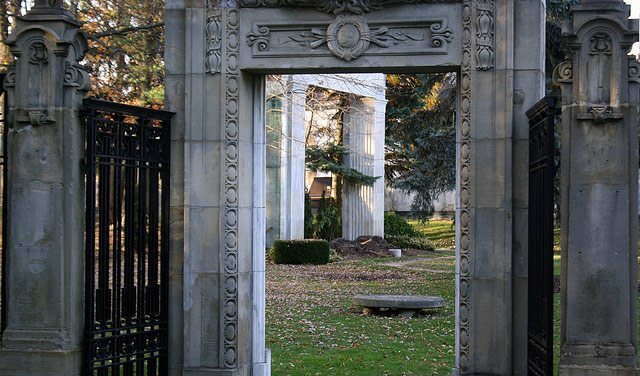 At the opposite end of the city, Friends of the Guild Park and Gardens are working to revive the Scarborough landmark, which has suffered from “demolition by neglect.” President John Mason discussed that the group wants to be part of a strategic plan, noting doing so would be far more effective than just complaining.